Lenox Hill Radiology | Madison Avenue Medical Imaging is one of Lenox Hill Radiology’s (LHR) convenient 25 outpatient imaging centers located in the metropolitan New York area. Our Madison Avenue location offers a complete range of imaging services including MRI (1.5T), CT, digital & 3D mammography, biopsy, ultrasound, fluoroscopy, calcium scoring, X-Ray, and DEXA for bone density measurement. Madison Avenue Medical Imaging offers 3D mammography, the latest technology in breast cancer screening. Studies show that 3D mammography detects 40% invasive cancers than traditional mammography alone. So when it’s time for your annual mammogram, trust our women’s imaging experts to bring you the very best. With the advanced knowledge of our expert radiologists, compassionate staff, and state-of-the-art medical imaging technology, we are able to offer you the most exceptional health care service possible. You can count on Lenox Hill Radiology to provide timely, transparent, and accurate information about all aspects of your radiology exam. 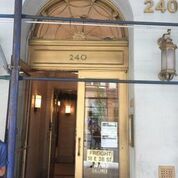 Lenox Hill Radiology | Madison Avenue Medial Imaging is conveniently located in Midtown, on the east side of Manhattan, at 240 Madison Avenue, 2nd floor (between 37th and 38th street) in the Syndicate Trading Company building. Transportation to our Madison Avenue imaging center is easy. Take the B, N, R, or Q train to 34th Street or the 4, 5, or 6 train to 42nd Street Grand Central. To learn more about the imaging services Lenox Hill offers, as well as our convenient hours, please call us today.